Jeb Bush goes full “anchor babies”: Hillary Clinton, Donald Trump fire back. 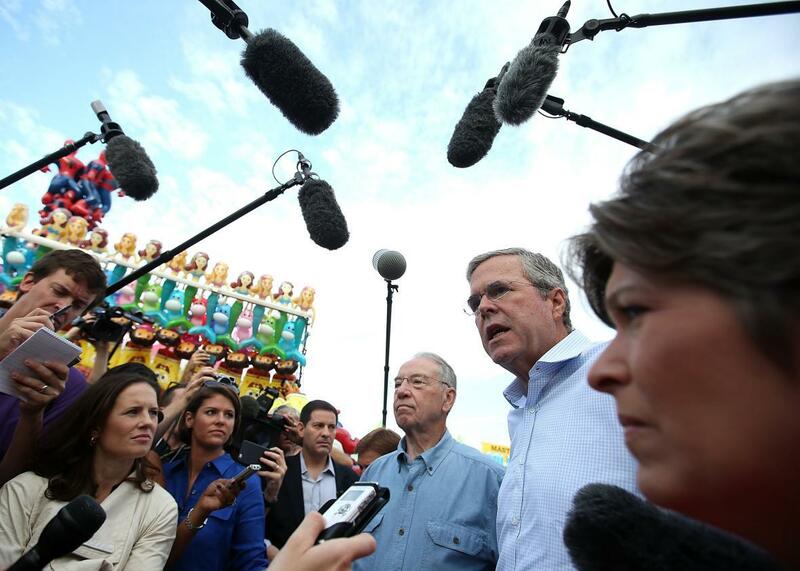 Jeb Bush talks with reporters at the Iowa State Fair on Aug. 14, 2015, in Des Moines. Jeb Bush’s attempt to echo Donald Trump’s un-PC talk on immigration by unapologetically using the derogatory term “anchor baby” is getting him hit from both sides of the aisle. Jeb Bush signed memo saying not to use the term "anchor babies," offensive. Now he wants to use it because I use it. Stay true to yourself! As you can tell by the “you know” that preceded the term, and the “as they’re described” that followed, the words anchor babies didn’t exactly roll off Bush’s tongue. That’s probably because, according to the Washington Post, it was the first time he’s uttered the term publicly on the campaign trail. It’s difficult to say whether Jeb intentionally decided to drop “anchor baby” into his talking point in a bid to appeal to immigration hard-liners or if it simply slipped out. (I’ve listened to the clip a dozen times, and could be convinced of either.) Regardless, he has decided to try to own it. Given the chance to walk it back on Thursday, Bush pressed ahead. “Do you have a better term? You give me a better term and I’ll use it,” he snapped at a reporter.